This UFO Documentary looks at the Canadian Underwater UFO Incident. The unknown object was then officially classified as a “UFO”. The Royal Canadian Navy soon launched an underwater search for possible debris, but nothing was found and the object was never identified. This UFO documentary investigates claims that a UFO was reportedly seen entering and traveling underwater which alerted a nearby U.S./Canadian submarine base. This Documentary goes in search of Canadas Underwater UFO Incident, one of the few UFO documentaries ever based on Shag Harbour UFO incident. Watch the full Extraterrestrial documentary here and if you like this show, please like and subscribe for more full UFO documentaries. The infamous and embattled Julian Assange had made prior comments to the announced release of many of his controversial intelligence leaks that there would be UFO related materials. Such was the case recently when Wiki Leaks revealed alleged compromised Department of Defense cable communications indicating that US armed forces may be in the midst of asecret war with UFOs. Dig a little DEEPER ~ THEI.us Archive “Underwater UFO” “Antarctica”. Featured Image: The aqueduct Veluwemeer is an aqueduct in the N302 near Harderwijk, Netherlands which also forms the border between the provinces of Flevoland and Gelderland. CREDIT: This photo was taken by Chris . Further distribution is permitted only under the same conditions as on the roads wiki, also known as the Creative Commons licenses “by” (attribution) and “sa” (share-alike) (by-nc-sa). Commercial use of this or other pictures of this user is not allowed without permission. SOURCE: Wegenwiki Category : Photo Chris Netherlands. 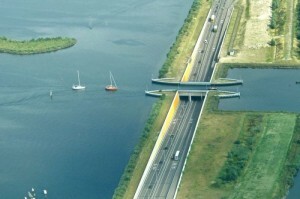 Aqueduct Veluwemeer is an underwater underpass in Netherlands that is located under a small part of the lake Veluwemeer and connects the mainland Netherlands to Flevoland, the largest artificial island in the world. . . Read Complete Report with photos. Photo: Source Acid Cow.com (Fair Use). Case Study: U.S. Military Killed 130,000 People In Nuclear Tests During a 12-Year Span (+) added videos. Words can’t describe the pain and suffering endured by survivors of the tragic 12-year wave of terror unleashed by the U.S. Government. MICRONESIA, THE REPUBLIC OF THE MARSHALL ISLANDS (INTELLIHUB) – 67 nuclear tests took place starting in 1946 and many living things, including humans, have been affected by the aftermath of radiation plumes released both undersea and in the earth’s atmosphere by the U.S. Government. In fact at the time it was unknown if any of the test explosions would actually fully ignite the oxygen in the earth’s atmosphere, possibly even decimating the entire surface of the planet. 0800002 – Project Crossroads – 1946 – 41:30 – Black & White – Project Crossroads was a series of two nuclear tests, Able and Baker, the first tests conducted at the Pacific Proving Ground, near the Bikini Atoll in the Marshall Islands. 0800018 – Operation Wigwam, Commander’s Report – 1955 – 35:45– Color – The U.S. Navy, envisioning a war in which atomic depth charges would be used, wanted to learn how much of a nuclear blast a well-built submarine could take. The submarine Skate had not withstood the BAKER explosion of Operation Crossroads. . . From Description included with video. A nuclear explosion occurs as a result of the rapid release of energy from an intentionally high-speed nuclear reaction. . . . From Description published with video. Featured Image: Ufo coming out of the water. SOURCE: DamnCoolPictures.com (Public Domain).